Apple on Monday officially killed Chomp's service, including its iOS app and website, after having purchased the company to obtain and imtegrate a number of app search and discovery assets into the iOS 6 App Store. Following the September rollout of iOS 6, which includes the built-in Chomp-based App Store, Apple decided to kill off the app search engine altogether, evidenced by messages received by users saying saying the service has been discontinued as of Sept. 30. Apple purchased Chomp in February for a reported $50 million to enhance its App Store, subsequently ending the service for Android users in April. Previous to the Android shutdown, Chomp powered Verizon's Android app search engine. 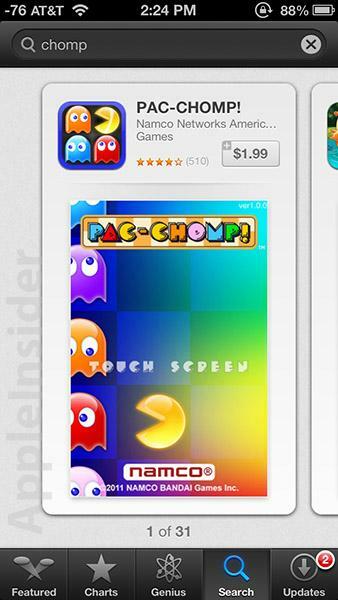 The Chomp-style App Store was first seen in August when Apple rolled out a pre-release version of iOS 6 to developers. While the new App Store offers backend improvements, especially in app discovery, many users have complained the layout isn't as intuitive as the legacy model. Currently, the App Store features "cards" or "panes" which allows only one app to be displayed onscreen when using an iPhone, whereas the original design featured a scrollable app list. The new layout is well suited for the iPad, however, due to the extra screen real estate. The end of Chomp comes on the same day as Ping's demise and a scheduled drop in free iCloud storage space temporarily granted to previous MobileMe users.